Outdoor audience recordings from the early 80's are something very special. They give off a certain vibe that can't be found in the decade before, and seems to slip away as the 80's move along and the band's popularity grows. This is a time where first sets can sometimes exceed second sets, and the overall energy of the band is rocketing beyond its more mellow mood of the 70's. Joani Walker's recording of this daytime, outdoor show at SIU in Edwardsville, IL is pure gold. Despite the rain, and at times it was A LOT of rain, Joani captured this show all the way through. 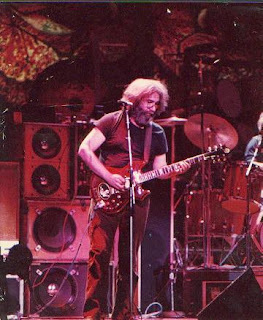 Even when the rain was pouring down in the second set during Ship Of Fools, and you can hear it clatter over the plastic cups covering the mics, she sticks it out and manages to preserve this fantastic show and classic vibe of being at an outdoor show in 1980. This "vibe" is something unique to the time period, and speaks a language of the Grateful Dead that resonates unlike other periods. It's as truly Grateful Dead-like as the late 60's or mid 70's - an important part of any Dead tape collection. The band is firing on all cylinders right out of the gate. Jerry is in fine form and seems to be giving everything an extra something special. This is made all the more enjoyable by the excellent sound quality of the tape. It's a wonderful document of band's evolution - Brent now a firm fixture, and many new tunes finding their solid footing. Older tunes are starting to really feel like "classics" now. Everything in set two sizzles with psychedelic energy in all the right places, from the white-hot China>Rider to the deep and stirring Estimated Prophet and Other One. Then, the Black Peter in particular is perfectly delivered. It moves through you like a warm breeze, and cradles you like a baby. There's nowhere else you want to be. "This "vibe" is something unique to the time period, and speaks a language of the Grateful Dead that resonates unlike other periods. It's as truly Grateful Dead-like as the late 60's or mid 70's"
Too true! Good call on this baby! Such a great show. I had a friend who taped the show and at one point slipped during the rain. Laughs. I remember getting my first copy from him at the beginning of the Warfield run. We came out after the show, went to my place and played it the rest of the night. This is still one of my favorites. I missed this show, but I am sure this show would be a fantastic one as same as the previous show.